A couple of times a year, I get to indulge my Civil War obsession with a road trip. The first week in August was my most recent example of the genre. This time I headed east, intent on libraries and battlefields. My research focus is now on materials related to the Atlanta Campaign. 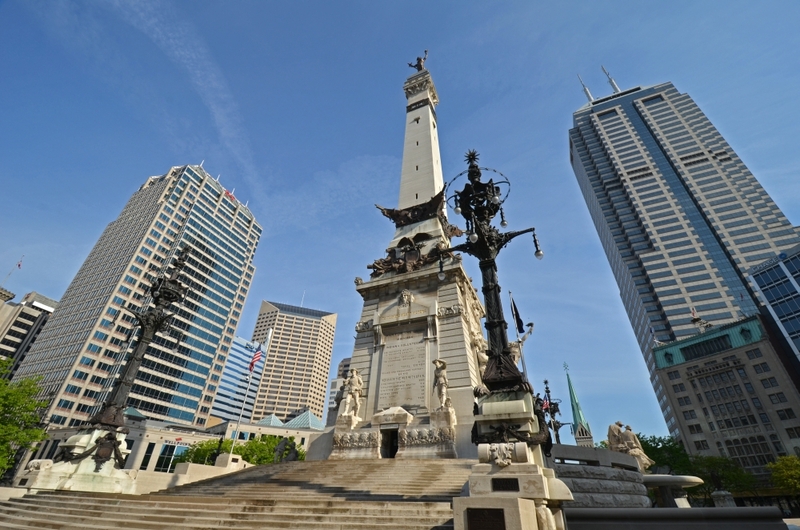 First stop was Indianapolis, home of the Indiana Historical Society, as well as a spectacular Soldiers and Sailors Monument. The picture above shows what it looked like in 1907. And today? The IHS is home to a very large collection of civil war manuscripts, and I have been working my way through them step by step. I spent 6 hours on Saturday in the reading room, and collected about 350 digital images. On Sunday I went to Gettysburg, where I managed to tag along on a fine battle walk given by Park Interpretive Ranger John Hoptak. John led our group of about 15 through the Wheatfield, a most confusing fight indeed. It is also one of my favorite parts of the field, and John brought much clarity. Here’s a look at the 17th Maine monument in that same Wheatfield. After that it was on to Carlisle. The Army Heritage and Education Center is a crucial site for anyone interested in Military History research. I spent two days in the Ridgway Reading Room (Monday and Wednesday) pouring over yet more old documents. I captured almost 500 digital images here. I examined roughly 80 manuscript collections, but I will certainly have to go back next year. And I haven’t even started on the books, newspapers, or pamphlets. Perhaps you have heard of the controversy surrounding the National Civil War Museum in Harrisburg, Pennsylvania – where the current mayor of Harrisburg would like to close the Museum, mostly due to some unfortunate financial shenanigans perpetrated by the last mayor, in order to make the Museum a reality. Unfortunately, despite having no role in those shenanigans, the current Museum leadership is now fighting a wave of publicity suggesting the museum’s imminent demise. That is not true, and fear not: the National CWM is going to remain open. If you haven’t visited, you should. I was there to contact the archives staff about doing research in their largely unexplored holdings. Even though my visit was only preliminary, they were able to help me with three very nice finds: a set of surgeon’s letters from the 17th Ohio, a very fine diary left by Lt. Robert B. Davidson of the 35th Ohio, and a similar journal from a member of the 13th Tennessee Infantry (Confederate.) The museum is a treasure-trove. I look forward to returning. Director Wayne Motts was kind enough to show me around the place, including behind the scenes (where all the “good stuff” is kept, as any archive junkie knows) and he pointed out some very cool artifacts. 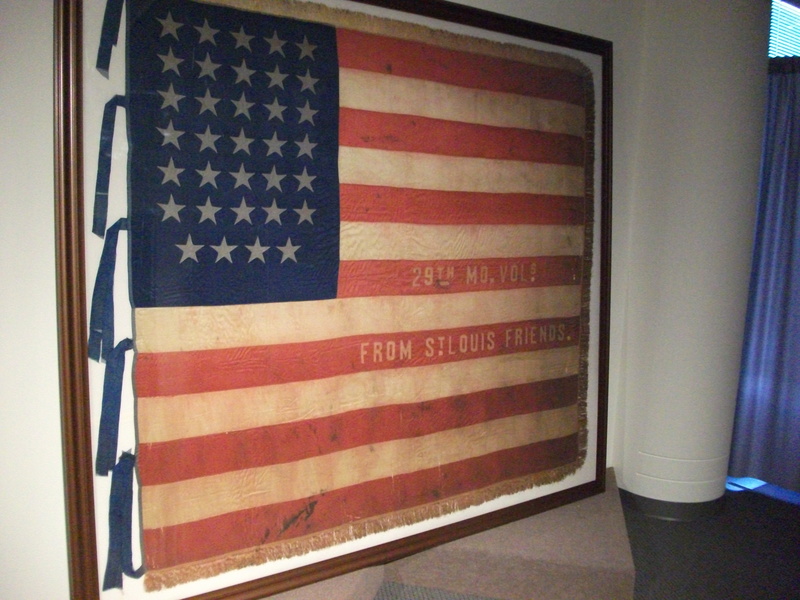 This flag, belonging to the Union 29th Missouri Regiment, was captured at Ringgold Gap by some Texans, and turned over to Confederate Major General Patrick Cleburne. As you can see, it is in great shape. It is now framed and displayed in the Museum’s education room, where it presents a striking image. It’s also huge, about 70×72 inches, and I can’t imagine having to carry it, unfurled, in battle. That must have been exhausting. On Thursday I visited a friend in Arlington Virginia. We managed to spend some time in downtown DC, taking in the Museum of American History and the Portrait Gallery. Along the way I made sure to visit General George H. Thomas. It’s always good to see Pap. Friday and Saturday, of course, were spent with my comrades at Emerging Civil War. 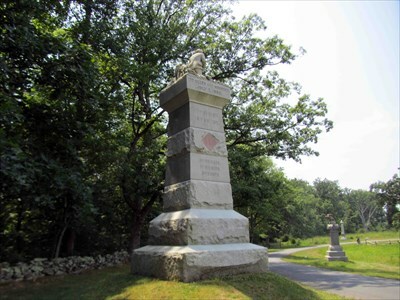 Friday morning Kris White led several of us on a wet but by no means unpleasant tour of the fighting positions of the 26th Wisconsin and 82nd Illinois Regiments, who faced Stonewall Jackson’s onslaught on the evening of May 2nd. Both the 26th and 82nd were German regiments, recruited out of the large immigrant populations in Milwaukee and Chicago, men who fervently believed in democracy, freedom, and abolition. I have developed a strong interest in German units like these, both east and west; and so I was very happy to have the chance to follow in their footsteps at Chancellorsville. That evening, I was in the audience for our Keynote speaker, Dana Shoaf, and our Q&A panel. Saturday saw the meat of the Seminar, seven presenters all exploring the theme of Civil War Legacies – of which I was one. I spoke on General John Bell Hood, whose legacy is actually undergoing some revision at the moment. I find the process by which the Civil War community explores such themes fascinating. In addition to Hood, several other historical figures seem to be receiving this treatment at the moment, including both George B. McClellan and Ulysses S. Grant. In general, the talks impressed me with how deeply the Civil War still connects to the rest of America’s story, and how recent some of those connections are. Happily, the Seminar was a bit of a personal success, as well – I sold out of all copies of my titles brought along for the trip. I look forward to seeing everyone at next year’s seminar, if not sooner. Dave- Your trip sounds super fabulous! I’m so glad the public is still able to utilize the archives and hidden treasures of the National Civil War Museum- as a museum person myself, it’s always a surprise to find out that only a small portion of many prominent museum’s collections are available for public view! Sounds like a great trip not only for research but for catching up with friends-old and new!